With over 300 acres of conservation land from mauka to makai, Waimea Valley in Oʻahu’s idyllic North Shore is a wonderland for learning. By connecting young people to the ʻāina and moʻolelo of the Valley, we empower and engage younger generations to not only deepen their understanding of Hawaiʻi’s rich history and traditions, but to also become environmental and cultural stewards in our global community. 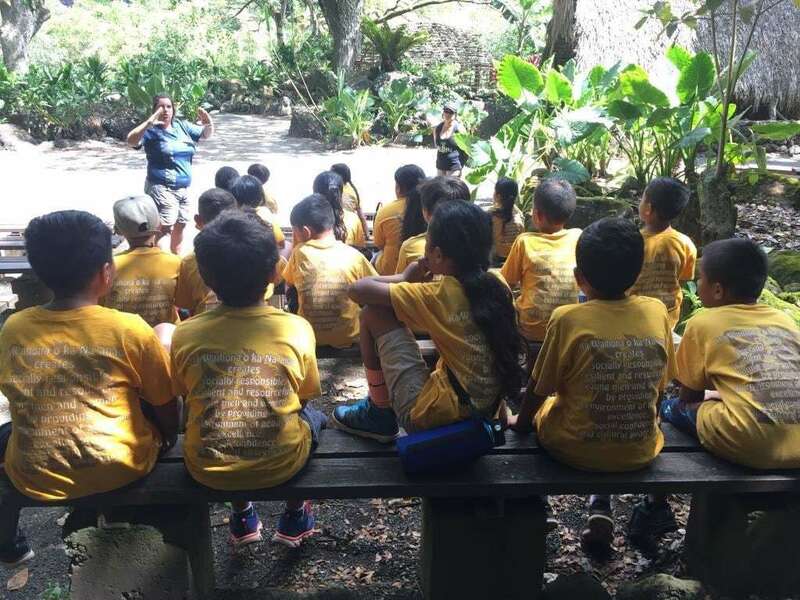 Waimea Valley’s K through 12 educational programs is thoughtfully designed to perpetuate indigenous knowledge in meaningful ways that extend far beyond the classroom. From problem solving skills to building self-confidence, strengthening ancestral ties, and igniting a renewed curiosity about our world, Waimea Valley’s hands-on framework for learning can be customized to meet your educational needs and goals for any and all ages. Nā Lole Kānaka: Traditional Hawaiian Clothes Nā Lole Kānaka introduces the early childhood learner to how people in old Hawai‘I used natural resources to make and design their clothes. The students will be able to see the plants used for clothes growing in their natural state. Hands on activities will include learning about the tools and methods involved, they will also have a chance to dress up in the different types of clothing that Hawaiians traditionally wear and learn Hawaiian songs that teach children about traditional clothing. E Mālama I ka Āina, Take Care of the Land that Sustains Us, focuses on the reciprocal relationship between land and people, conveyed through the cultivation of food. Through fun, hands-on activities, students learn how to mālama plants, grow seeds, make natural insect repellent, and create compost. E Mālama i ka Wai, Take Care of Water, reinforces the importance of fresh water in an ahupuaʻa. Students explore Kamananui Stream and the muliwai to observe and identify different species that rely on fresh water to survive, culminating in the planting of native species to aid erosion efforts within the Valley. In Ahupuaʻa, Mountain to the Sea, students are introduced to resource management methods that utilize native plants and indigenous approaches to conservation. In the process, students build their native species fluency, discover their numerous healing properties, and create a tool for conservation they can use at home. Through Nā Wai Noho ʻIa o Waimea, The Inhabited Waters of Waimea, students learn the value of fresh, clean water in an ahupuaʻa. Fresh water is the source of all life, illustrated in an activity that introduces students to the endangered, native species that rely on the Valley’s fresh water habitat for survival. These include the ʻalae ʻula, Hawaiian Moorhen; and the oopu, Hawaiian Goby Fish. Nā Pāʻani Kahiko, Ancient Hawaiian Games, students try their hand in playing the traditional games and activities that were a part of daily life in ancient Hawaiʻi. Waimea Valley’s Hawaiian Game Site takes center stage, as students learn first-hand how values such as teamwork and sportsmanship, are promoted through participation in these daily activities. Ke Awāwa o Waimea, The Valley of Waimea, leads students on a guided walk to our Wailele and back. All 6 cultural sites, Kamananui Stream, and our native and rare plant collections are highlighted in this comprehensive, 3 hour cultural tour. Pūlama Nā Kūpuna: Cherish the Elders Pūlama Nā Kūpuna is designed for seniors that are interested in experiencing Hawaiian culture set at a leisurely pace. They will be introduced to the ahupua‘a of Waimea Valley in an open forum of instruction where questions are welcome. Our educators will teach a simple craft that can be made and kept as a memento of their visit to Waimea, and a simple hula will be taught. The entire group of seniors will be invited to take a walk through the Valley to the waterfall and back where they get to personally see the ahupua‘a of Waimea. At Waimea Valley, we specialize in bringing your classroom outdoors. Come and feel the difference. If you are interested in requesting a reservation please fill out the form below.